Very High performance Nema23 4Nm Stepper Motor Checkout Video below to see capability of high.. 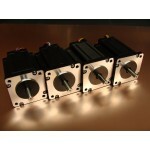 Very High performance Nema23 4Nm Stepper Motor Checkout Video below to see capability of ..
Nema 23 Stepper Motor mount. Standard Motor Mount for Nema 23 Steppers made from 6082 T6 Aluminiu..
Nema23 4Nm High torque Stepper Motor Driver Kit This Kit contains the following matched parts..